Sonic Peeler is not an ordinary standard blade peeler but includes a set of 3 interchangeable blades that are used for specific purposes. It consists of a Heavy Duty Blade made for hard to peel food items like potatoes, eggplant, cucumber, etc. Another blade in the set is the Light Duty Blade and is used for somewhat subtle peeling like carrots, garlic, fruits and even tomatoes unlike any other peeler that is available in the market. An added third blade is the Julienne Blade which is perfect for shoestring slices to make great stir fry. Sonic Peeler is not just good for fruits and vegetables but is also helpful to achieve parmesan cheese shreds over a salad or even grate chocolate for dressing up the perfect dessert. 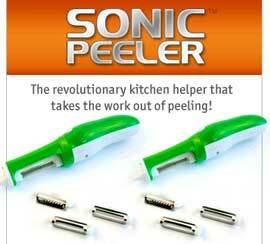 Second Sonic Peeler and a 3 blade attachment set is available absolutely free.